KontrolFreek is one of my favorite brands when it comes to gaming. The reason is simple. They make niche products for console gamers. My favorite being the FPS Freek thumbsticks I’ve reviewed in the past. KontrolFreek products are fairly inexpensive, are made with high quality, and have many variations to choose from. Today marks a different day. 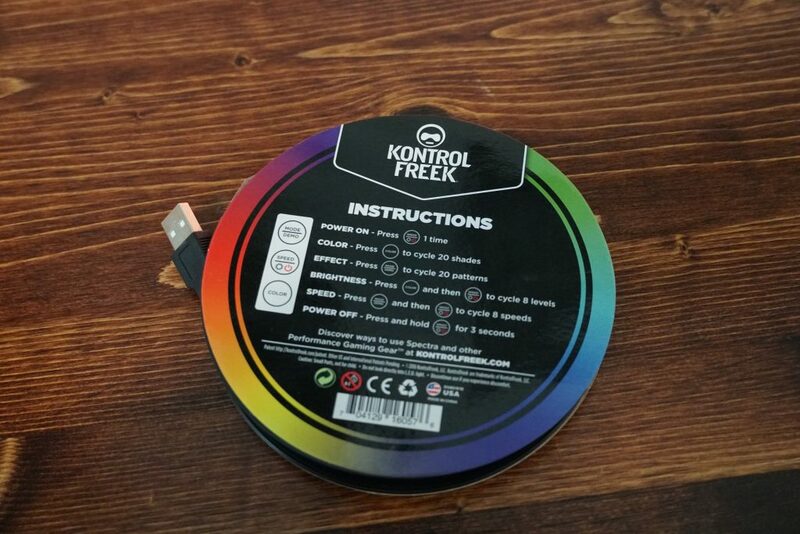 KonrolFreek now has RGB light kits! They call it “Gaming Lights” which is about as simple as it gets. What I love is it’s a complete kit from a name brand for only $25. That’s 9 feet of RGB LEDs with 3m adhesive, USB power, and an inline remote. If that’s not enough, you can detach the strip in 18″ segments, or even purchase additional 18″ strips for only $6 a pop. The LEDs are extremely bright but do not have the rubber coating on top found on many popular kits online. Everything is exposed but it’s easy to work with and very flexible (90 degree bends wherever you see a KF logo). As far as lighting options go, you can cycle through 20 shades of color, 20 different patterns, 8 levels of brightness, and 8 speed levels. It’s pretty robust for such a seemingly simple and affordable package. I’ve used it extensively and haven’t run across an issue yet. The only downside is lack of memory when USB power is cut. If you plug it into a device or monitor that disables USB power when it’s powered down, turning it on will make the Gaming Lights start in RGB cycle mode, regardless of what your prior setting was. This isn’t the end of the world, but make sure you know what you’re getting into in case this system isn’t right for you. The Xbox One has constant USB power, so you could always use one of those USB ports and use the power button on the Gaming Lights in-line remote to turn it on and off. For $25, it’s hard to beat. SteelSeries Apex M500 Keyboard Review – Best Mechanical Under $100?